Airwheel facilitates medical service by joining hands with Ros Medika Karya. Abstract: As we know, Airwheel self-balancing electric scooter has been used in various places, such as the airports, factories and theme parks and so on. Recently, Airwheel cooperates with Ros Medika Karya, one of the most widely used medical institutions for the first time, with the aim of facilitating medical service. Up to now, Airwheel electric self-balancing scooters can be seen in airports, factories and theme parks and so on. Because of its flexibility and utility, Airwheel intelligent electric scooters have been adopted into a new field—health service to let more patients benefit from the timely treatment. 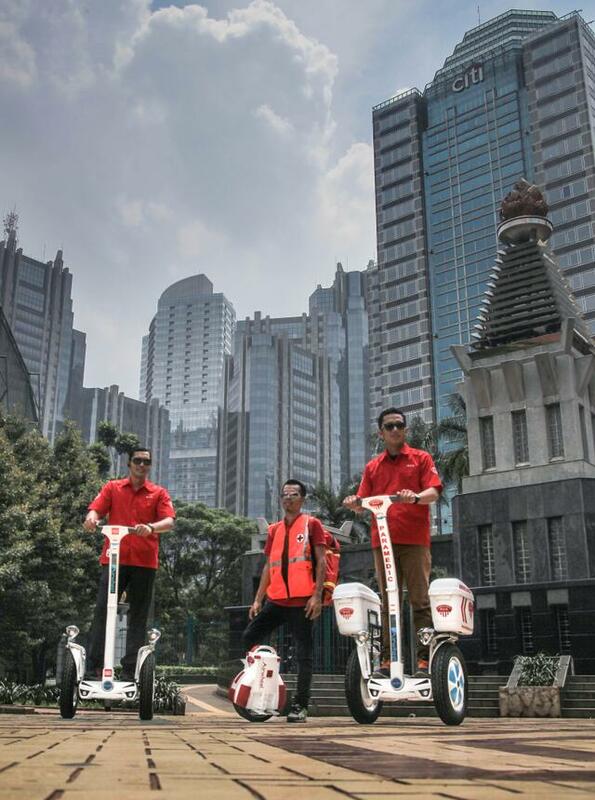 For the first time, Airwheel intelligent electric scooter joins hands with Ros Medika Karya to make the first aid team arrive destination faster, especially such crowded places as concerts, exhibition and outdoor sports etc. Airwheel S5 is more than a simple electric vehicle, but a real SUV, with 680wh of electricity and 16 inch tires. It is worth mentioning that the 16 inch tires are specially designed ensuring maximum stability and adhesion in all ground conditions, even on sand. Apart from the Airwheel electric self-balancing scooter S5, the Airwheel Q3 twin-wheeled electric scooter has joined the ambulance team. 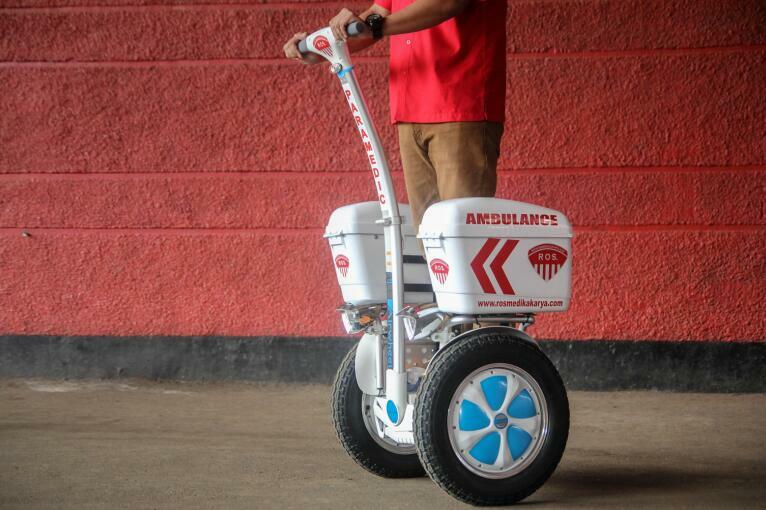 The innovative twin wheel system provides the Ros Medika Karya staff an easier balancing for more stability on irregular road surfaces. Compared with S5, Q3 intelligent electric scooter is much smaller and more agile. Riding Q3 twin-wheeled electric scooter, staff can shuttle freely in the crowded with a fist kid backpack. 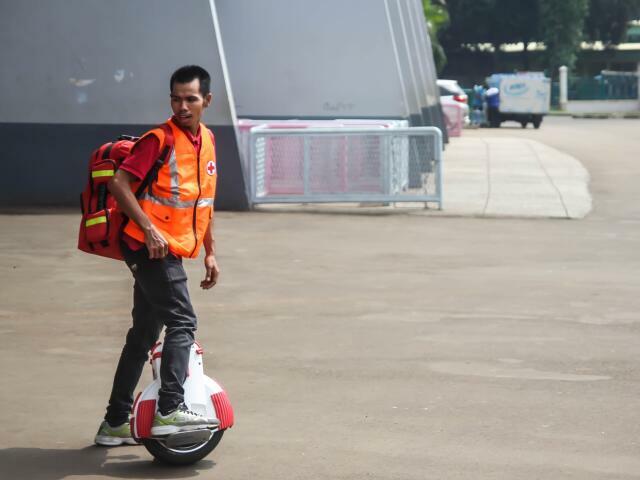 Thanks to Airwheel electric hoverboards, Ros Medika Karya staff can arrive the destination in a faster speed and it is more efficient in terms of reaching more people in the limited access place. In conclusion, with Airwheel, medical service, especially the first aid can be delivered more efficiently, as less time means more lives. Previous：Com a junção de novos produtos para Airwheel, qual é o mais caro a seu coração?